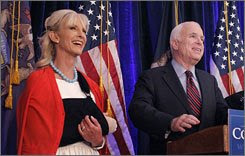 As if it wasn’t bad enough, now a presidential candidate’s wife is trying to copy me! Her name is Cindy. My name is Cindy. She sprained her wrist. I broke my foot. She is a fake blonde. So am I.
She’s a Republican; me too. Her husband’s name is John. My DH’s name is Mark. They are both books in the Bible. Is this a mere coincidence? Definitely not. Can you see where I’m going with this? Is it not astonishingly obvious?? If not, enjoy this brief video of me on one of my maiden voyages on my Free Spirit or FS as I affectionately call it! Notice my form, nice. Tomorrow is hard cast day. I haven’t had one of those since the third grade. Wow – that is so freaky!! (i could not get the video to work but i did get to see the real thing yesterday). Wow… your right leg is going to be so strong!